Frosthammer, the third installment in the Aetheaon Chronicles is available in Paperback, Kindle, and KindleUnlimited starting today. Fans of The Lord of the Rings and The Game of Thrones should enjoy this book. Epic Fantasy. 401 pages. 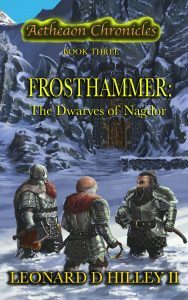 During the Battle of Hoffnung, Boldair discovers his father’s secret betrayal and is declared Nagdor’s new king by the Northern Dwarven Alliance. Boldair and three of his fellow Dwarves begin their journey to Nagdor for his coronation. Due to possible threats on his life in opposition to his taking the throne, he decides to take a longer route home by detouring through the autonomous, majestic city lost to legend and hidden deep beneath the Frosted Peaks. The city is Frosthammer, which is occupied by an unusual Dwarven race that are untrusting to visitors, even new kings. The journey becomes fraught with more dangers than Boldair ever expected or imagined.